Saline is sprayed into the inflamed sinus to flush out the pus and mucus. The system is removed, leaving the sinuses open. Balloon sinuplasty technology extends the sinus surgery evolution by offering the surgeon additional tools for endoscopic surgery. It uses a small, flexible, sinus balloon catheter to open up blocked sinus passageways, similar to the way angioplasty uses balloons to open blocked coronary arteries. In our Los Angeles balloon sinuplasty, a small sinus balloon catheter is threaded through the sinus passages and introduced into the sinus. When the sinus balloon is inflated, it gently restructures and widens the walls of the passageway while maintaining the integrity of the sinus. This restores normal sinus drainage and function, while preserving normal anatomy and mucosal tissue. Balloon sinuplasty is often combined with endoscopic sinus surgery. Not all patients are candidates for this type of sinus surgery. For example, balloon sinuplasty is not effective for removing nasal polyps or in patients with extensive scarring of the sinus openings. Neither is this technique effective in treating ethmoid sinusitis, affecting the small sinuses located on each side of the nose between the eyes. How is Balloon Sinuplasty Performed? Balloon sinuplasty can be performed under local or general anesthesia. The surgery is performed entirely through the nostrils -- no incisions are made on the facial skin. An endoscope (thin camera rod with a light at the end to provide visualization and magnification) is used to directly view the nasal cavity and sinuses. Working endoscopically through the nose, the surgeon threads a catheter into the sinus cavity. A small balloon is passed over the catheter into the sinus. As the balloon is inflated, it gently restructures and widens the walls of the sinus passageway while maintaining the integrity of the sinus. Under direct visualization, the natural drainage pathways of the sinuses are opened. The patient is discharged to go home when the effects of the anesthesia have worn off after surgery. Balloon sinuplasty is less invasive than traditional sinus surgery. There are no incisions made in nasal bone or tissue and no bone or tissue is removed from the nose in the procedure. This technique is less traumatic to the surrounding tissue and preserves the natural sinus openings. It has been shown to be effective in providing long-term relief from sinusitis symptoms. Dr. Zadeh at Los Angeles Sinus Institute is one of the first Los Angeles sinus surgeons to offer balloon sinuplasty on-site, in the doctor’s surgical suite. In-Office Balloon Sinuplasty™ is an immediate and minimally invasive method to address recurrent or persistent sinus problems without surgical knives or incisions of any sort. In-Office Balloon Sinuplasty™ is an FDA-approved technique designed to improve the drainage of the sinuses in a matter of minutes. This fast procedure helps to minimize discomfort and recovery, allowing patients to return to work or school the same day the procedure is performed. 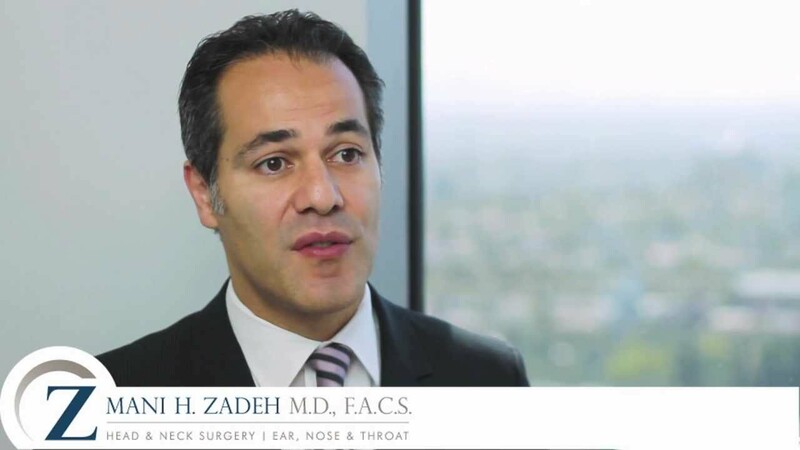 Dr. Zadeh is a Board Certified Otolaryngologist-Head and Neck Surgeon, recognized by his peers as a leader in his field. He has extensive experience in minimally invasive image-guided surgical approaches and uses the latest and most advanced medical and surgical techniques to treat sinus disease. If you suffer from chronic sinusitis, the first step toward obtaining relief from your symptoms is to schedule an initial consultation at Los Angeles Sinus Institute. Dr. Zadeh reserves surgery for cases in which it is the most appropriate and effective treatment and strives to deliver the best balloon sinuplasty Los Angeles has to offer. Whether it involves surgery or alternative treatment options, Dr. Zadeh will individually tailor the most effect, least invasive treatment plan for your condition. It has not quite been a year since my balloon sinuplasty, but I felt compelled to thank you for everything that you have done. I remember first coming to you, absolutely desperate, as I had sinusitis for nearly all of my life, causing me to had a tonsillectomy and adenoidectomy at 2 and 1/2 years of age. From there, I proceeded through many years of antibiotics, nasal sprays, and most tragically, flare-ups every 6-8 weeks, causing me to feel sick for weeks on end. After reaching a breaking point at around 35 years old, I proceeded investigating surgical options, seeing 5-6 ENT’s and 2 surgeons. Finally, my primary care physician suggested that I contact you. Your approach was methodical and meticulous, starting with a conservative course of treatment—antibiotics, sprays, allergy shots etc. Because I did not have too much luck with those treatments, we proceeded with the in-office balloon sinuplasty. The procedure was a breeze, taking about 2 hours in the office, with no pain and only mild discomfort for a few hours. Hillary was nothing less than amazing during the procedure—she was both nurturing and knowledgably, a fantastic combination. Since the procedure on 12/9/11, I have not had any sinus issues. I am hesitant to mention this, as I am scared to jinx my good-fortune. My true good fortune, however, was finding you as a doctor. I thank you for your distinctive approach to medicine; I thank you for you for honoring and respecting your patients; I thank you for fixing my sinuses; I thank you for making me happy. You are my hero. Sinusitis is the inflammation of the tissue lining of the sinuses. This condition is often the underlying cause of chronic, allergy-like symptoms. These sinus cavities have air-filled pockets that have a tissue lining called mucosa, which produces mucus. For those that suffer from sinusitis, the mucosa becomes inflamed and releases excess mucus that is thicker, leading to infection. If you live with chronic sinusitis, it takes a heavy toll on your quality of life. Many experience acute symptoms that can last up to four weeks. Those that experience more severe and longer-lasting symptoms can suffer for several months. A balloon sinuplasty can be comfortably performed under local or topical anesthetics. Every patient has a different level of comfort when it comes to tolerating pain. Any discomfort you feel following the procedure could vary depending on the sinus operated on and if you required any additional sinus or nasal treatments. If you are worried about the level of pain, you might experience we can discuss your options. We pride ourselves on ensuring patient comfort in every procedure. What is the Material of the Balloon Made Of? A balloon sinuplasty is safe for anyone who has an allergy to latex. The balloon material is made from plastic, with no concerns for those who may have an allergic reaction. Pediatric sinusitis is quite common in children. Many children are treated with antibiotics which either don’t resolve the condition or can become less effective over time. Balloon sinuplasty can provide relief to children suffer from chronic sinusitis, greatly improving quality of life, and avoiding the overuse of antibiotics. Balloon sinuplasty is a safe and effective treatment for symptoms in children. As the treatment is less invasive than traditional sinus surgery, there is a very low complication rate. Can I Drive After Treatment? The majority of patients are able to drive themselves home after balloon sinuplasty. You may choose to have someone drive you for your own comfort or should plan for help if you had a stronger anesthetic that could make driving unsafe. Do I Need to Take Off Work? Balloon sinuplasty is minimally invasive and is typically performed on an outpatient basis. There is usually no external change to a patient’s appearance that others will notice – the changes are within the nose structure. Recovery time can vary by patient, but most people can return to their normal routines within 24 hours after surgery. How Effective is a Balloon Sinuplasty? Research shows that balloon sinuplasty provides long-term relief from sinus symptoms by opening the blocked passageways. It has dramatically improved the quality of life of patients who have suffered from chronic sinus problems. Balloon sinuplasty will not need to be repeated in the future. Will My Nose Be Packed with Gauze? New technologies have eliminated the need for nasal packing post balloon sinuplasty surgery. After balloon sinuplasty it is common to experience some bloody drainage for the first couple of days after you have the procedure. The drainage quickly reduces and there is no need to suffer with unpleasant packing within your nose. Can I Stop Using Nasal Sprays After Balloon Sinuplasty? There are several different nasal sprays that doctors recommend — some for inflammation and allergies, and others for infection. Talk with your doctor to understand why you have been prescribed the nasal spray and whether you need to continue using the product. During your initial consultation, Dr. Zadeh will examine you, study your CT scan, if one is available, and discuss your medical history to determine whether you are a good candidate for balloon sinuplasty in Los Angeles. He will explain the surgery and what you can expect, answer any questions, and address any concerns you may have. At Los Angeles Sinus Institute, we implement distinctive surgical approaches using the safest, minimally invasive, cutting-edge techniques. Dr. Zadeh is focused on advanced techniques and treatment options that offer his patients the most positive health outcomes while minimizing risk.